We are monumentally fortunate to have Captain George Miles as one of our Easy 508 PIR Sponsor Veterans. Captain Miles is a distinguished graduate of the honorable University of Notre Dame. As a Lieutenant during D-Day, George jumped into Normandy as the 2/508 Battalion S-4. He was wounded during the hedgerow fighting and taken to Hill 30 until he could be evacuated to England. After recuperating, George returned to the Regiment just prior to the Ardennes conflict. 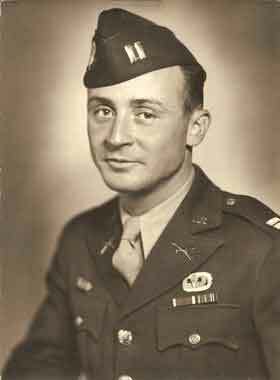 He assumed command of Easy during the Battle of the Bulge after his commanding officer, and best friend, Lloyd Polette was killed. 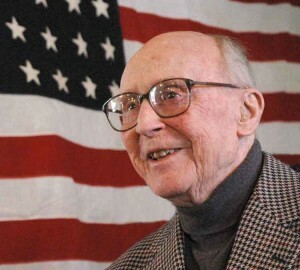 George remained in command of Easy Company through the Battle of the Bulge to the end of the war. After the war was over and the 508th was stationed in Germany as General Eisenhower’s honor guard, Captain Miles served as the 508PIR Regimental S-4.